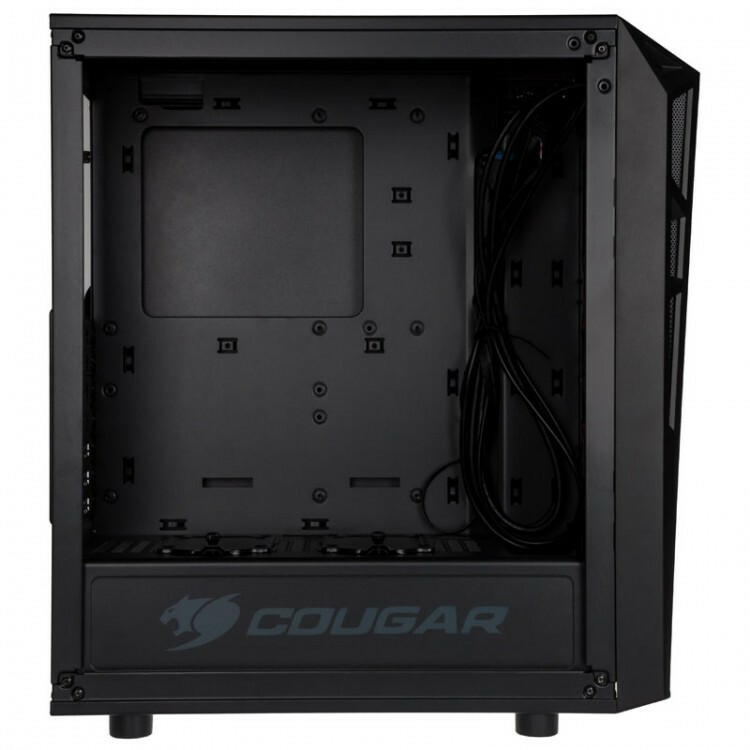 The Cougar Turret has an attractive angular form, it is a compact Mid-Tower that is ideal for customers looking for a good value and high quality case. It has two tempered glass panels. The first is a side panel, which lets you show off your computer's hardware. While the second on the front of the case creates an eye-catching glowing lighting effect when the two pre-installed Vortex LED fans are illuminated. Aesthetics aside the Cougar Turret is a practical case, it can hold motherboards with form factors from Mini ITX to ATX and up to three 350mm GPUs. The case also has enough space to store two 3.5" drives or a maximum of four 2.5" drives and comes an I/O that contains 2 x USB 3.0 ports, 1 x USB 2.0 and mic/audio support as standard. 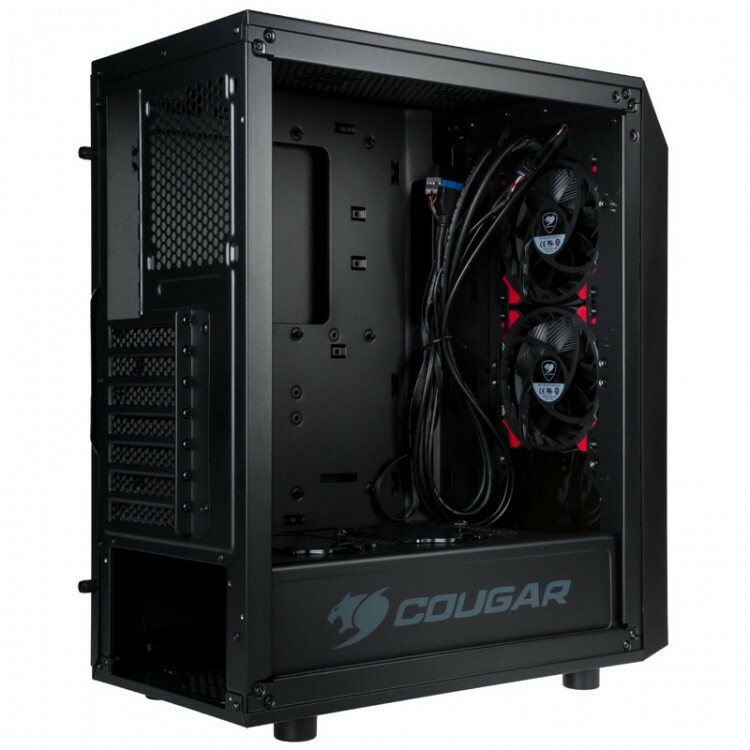 Cougar have made cooling a priority. 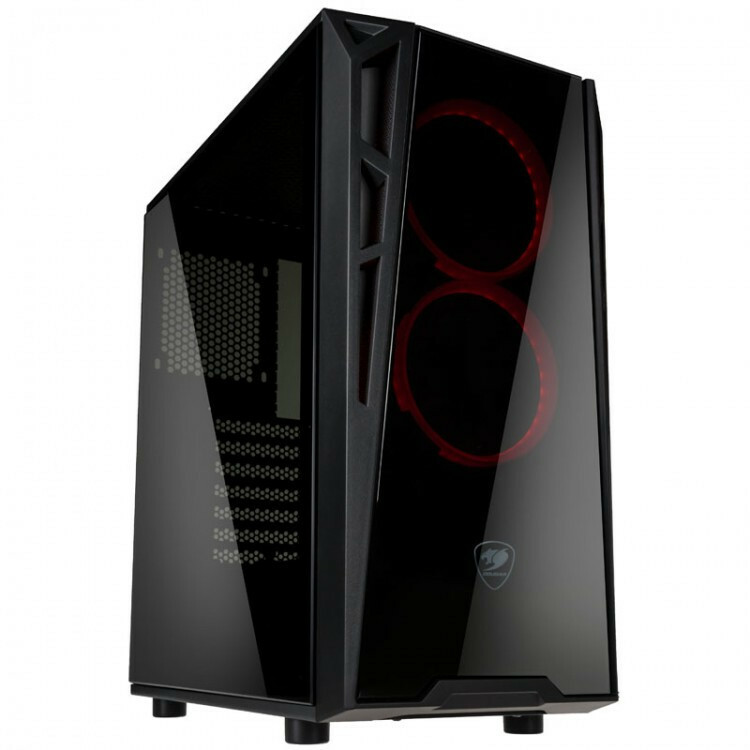 They have developed a "gaming vent system", which is an air inlet slightly offset from the case's front panel. This ensures effective airflow to components within the case and is covered with a solid plastic mesh that protects the inlet from dust. The Cougar turret comes with two pre-installed Vortex LED fans and support for an additional four. Alternatively, if you prefer water cooling, the Cougar Turret supports up to three radiators including a 360mm front mounted radiator, a 240mm top mount and finally a 120mm rear mount. Available for pre-order from £66.95. I must say this does look somewhat familiar to something I've seen recently. It's probably a phanteks you're thinking about, even if they look all the same nowadays...Well at least we have a pretty wide choice of options, i suppose we can't complain. Yes it does look a lot like a Phanteks, and about 80% of all others! Maybe they are using same OEM and tooling!! PSU shrouds are kind of a shame in my opinion. Could have easily had 3x120mm fans in the front. PSU shrouds are kind of a shame in my opinion. Suspect result would be like in vehicle inspection joke, in which inspector saying "passing through" means screw driver going through rusted bottom of car. 15 years ago separate compartment for PSU would have made sense with those garbage efficiency PSUs producing third of PC's heat output. Now actually modern PSUs produce about 5% of heat output, at least with European mains voltage. So PSU doesn't need any special airflow and neither it can produce significant amount of heat to case. Resulting shroud only making working inside case harder with less continuous open space. And don't want to think how hard it makes adding cable to PSU when adding some drive to PC. Could have easily had 3x120mm fans in the front. There is room, and places to mount three 120mm fans in the front. Ah, I see it now. Shroud basically cuts the flow in half though. I just personally don't think the shrouds are good, even aesthetically. The only benefit is for those who don't want to do any kind of cable management. I like PSU shrouds aesthetically and for simplifying cable management. I very much like just having all of my cables kind of poking up through the shroud or peeking around the mobo panel. I'll take an airflow hit for that. A fair compromise that I'd definitely like to see is removable shrouds on all cases. Not hard to do, you'd think. That said, I don't think there's any denying that it hurts GPU airflow to some extent by limiting the space for heat to diffuse out into. I imagine the diminished overall space also affects temps throughout the case. I've always assumed that anyway... ...I'm sure tests have been done. Same reason vertical mounting often hurts GPU temps, only not as extreme. You can't legitimately claim that the case is airflow-oriented with a completely closed-off, full-length shroud. I like how they say they made airflow a top priority. We've known for a very long time now that closed front panels KILL airflow. And a few puny ventholes and fan offset is not enough. You gotta REALLY open the thing up... ...I'm talking mesh front panels or at the very least big mesh openings running along the whole side of the panel. Like, lets be real man... ...how much flow could those little openings on that panel really allow? Think of it this way... if you measured the total open space on those cutouts in the front panel, would they even come close to the total combined open space of the top/rear exhaust? Not hard to see how much of a bottleneck that is when you think of it that way. Your intake capacity is so much less than your exhaust capacity that you'll never utilize your fan's max cooling capacity in a positive pressure configuration. Not with one, two, or three intakes... ...only difference with more fans is that they run quieter up to that bottleneck. They don't have to work as hard to get the force needed to pull decent volume. Still gonna hit that flow wall. It's like trying to supply water to the whole neighborhood with 1/2" diameter piping. I know he just added an RGB panel to his existing full length shroud, but this looks great. Would happily accept cases to have PSU shroud if it can be removed, so that it doesn't bother me in working inside case/complicate airflow etc. Because of that PSU shroud and other fashion consider Fractal Design Define R6 as plain back step from R5 functionality wise. This design philosophy of lots of new cases can be summed to: "Shiny outside, Sh*t inside"
With main goal being overloading few operating brain cells of average consumer with all fashion bling bling.